These intriguing characters are the “stars” of any ocean environment. Have you ever found yourself observing a starfish in a tidal pool or attached under the water on the headlands you are scrambling over? It seems as if they don’t actually move, although they do seem to get from here to there. How do they do that? Star fish, or sea stars as they are correctly named, as they are not really fish, have 100’s of tiny tube feet on their underside that propel the sea star forward, backwards, up or down. These tube feet also help hold and pry open a sea star’s prey. The sea star eats the muscles, clams, oysters or barnacles by extending its stomach outside of it’s mouth to eat and digest the food. This inside out method of eating allows the sea star to eat things that are too big to fit into their body. There are thousands of species of sea stars. Most have five arms stemming from a central body. 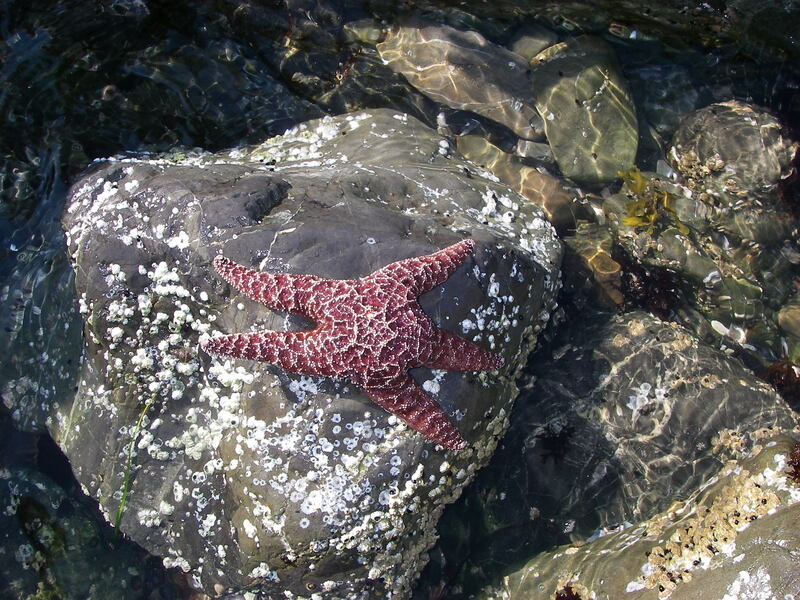 There are sea stars with more than five arms such as the sun star which has up to 40 arms. A sea star’s eyes are located at the end of each arm. They would have a very interesting perspective on things. The eyes which are little red dots don’t see well but can sense light and dark. They can lose an arm and then regrow it. It can take up to a year to regenerate a lost arm. If you have ever touched a sea star you might have been surprised at how rough and rigid they feel. They look like they would be slimy to touch but looks are deceiving. They have spiny ridges made of calcium carbonate that help protect them from predators. These sea creatures may be the “stars” of the ocean, but we know you are the star of your world!